Step out of Las Vegas to go to Boulder City and see Hoover Dam, which is approximately 50 minutes away. 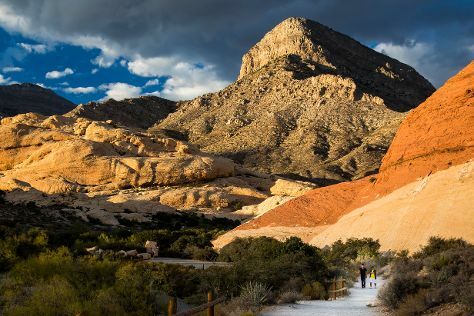 There's lots more to do: explore the stunning scenery at Red Rock Canyon National Conservation Area, shop like a local with The Strip, enjoy breathtaking views from High Roller, and take in nature's colorful creations at Bellagio Conservatory & Botanical Gardens. For maps, reviews, photos, and tourist information, read Las Vegas trip maker . London, UK to Las Vegas is an approximately 14.5-hour flight. You can also do a combination of train and flight. Due to the time zone difference, you'll gain 8 hours traveling from London to Las Vegas. Traveling from London in March, expect nights in Las Vegas to be somewhat warmer, around 13°C, while days are much warmer, around 27°C. Wrap up your sightseeing on the 17th (Tue) early enough to travel to Grand Canyon National Park. On the 20th (Fri), hike the day away at Bright Angel Trail. There's lots more to do: take in breathtaking views at Grand Canyon South Rim, take some stellar pictures from Grandview Point, trek along South Kaibab Trail, and tour the pleasant surroundings at Rim Trail. Inspirock's itinerary builder makes planning a Grand Canyon National Park trip simple and quick. Traveling by combination of car and flight from Las Vegas to Grand Canyon National Park takes 4.5 hours. Alternatively, you can drive; or take a shuttle. The time zone changes from Pacific Standard Time to Mountain Standard Time, which is usually a 1 hour difference. Traveling from Las Vegas in March, you will find days in Grand Canyon National Park are slightly colder (16°C), and nights are colder (-5°C). Finish your sightseeing early on the 20th (Fri) so you can travel back home.